Sculpture is no longer limited to materials like stone or metal. Sculpting in fabric is shown in ingenious detail here, with more than 350lavish photographs of 3-D cloth configurations along with insightful profiles of the 78artists who created them. The images and text capture the currents that are powering these works, like the do-it-yourself (DIY) movement established in the 1990s and the current revival of the revolutionary sculptural cloth of the 1960s. Works are approached through five themes: investigating nature, capturing the ephemeral, playing with space, telling a story, and "Take Heed." 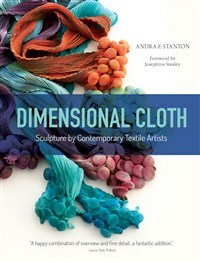 In her foreword, renowned fiber art expert Josephine Stealey helps us put this art form in context, from its origins in 1880 England's arts and craft movement to today. This is essential reading and inspiration for collectors, students, home artists, and anyone who appreciates innovative artwork. Josephine Stealey is an artist, curator, and Professor of Art at the University of Missouri. A nationally recognized artist in the contemporary basketry movement, she also teaches workshops across the country; juries exhibitions; and lectures on contemporary American basketry both nationally and internationally.